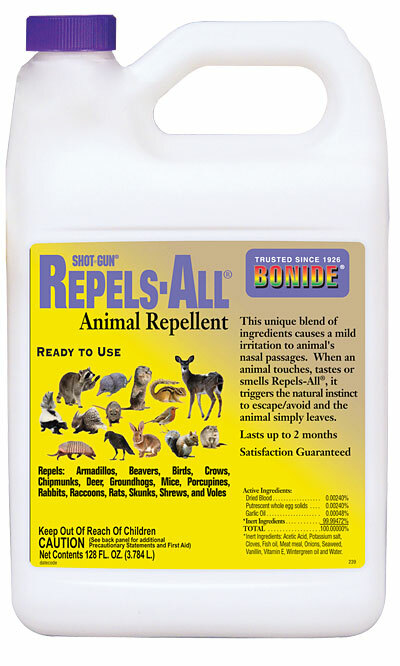 Prevent animals from grazing and nibbling your plants and property with Bonide Shotgun Repels-All Animal Repellent Spray. This environmentally safe and biodegradable animal repellent effectively repels deer, rabbits, squirrels, chipmunks, dogs, cats, raccoons, porcupines, armadillos, birds, rats, mice, beaver, ground hogs, skunks, voles, moles, and shrews from around your home and garden area. Using the attachable trigger sprayer, apply Repels-All to your garbage cans, barns, swimming pools, sheds, woodpiles, outbuildings, cabins, or any other area where animals are causing damage to your lawn, flowerbed, or garden for protection up to two months. Repels-All causes a mild irritation to the animal's nasal passages which triggers a natural instinct to escape or avoid the unpleasant irritation. Repels-All causes no harm to animals but does persuade them to reconsider their intentions. Although absorbed by the plants' foliage as well as the root system, Repels-All will not harm plants but may impart an undesirable flavor to certain leafy vegetables such as lettuce, cabbage, spinach, and herbs. To protect bulbs from being disturbed or eaten, treat them with spray and allow to dry before planting. To prevent newly planted seeds from being disturbed, spray with Repels-All at time of planting. Thwart animals from destroying your property with Bonide Shot-Gun Repels-All Animal Repellent.